I love pancakes on Sunday mornings - but I usually end up reverting to a box mix since I don't want to spend the time making some from scratch for just the two of us. Luckily I finally found my solution - a homemade mix - just add an egg and water and its done! Could not be easier to do! These pancakes were light, fluffy and tasted great. The secret to the great taste is that they use real butter and the mix is stored in the freezer. It's also super easy to put together with your food processor. 1. Process all of the ingredients in a large food processor - until there are no lumps and the mixture is the texture of sand - at least 2 -3 minutes. 2. 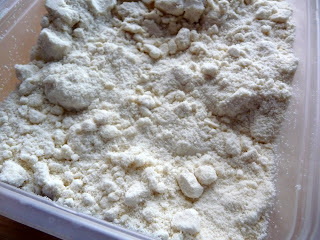 The mix can be frozen for up to 2 months - store in the freezer and not in the pantry or fridge. 3. To make the pancakes - add one lightly beaten egg and 1/4 cup of cold water to 1 cup of the dry mix. Stir to combine. 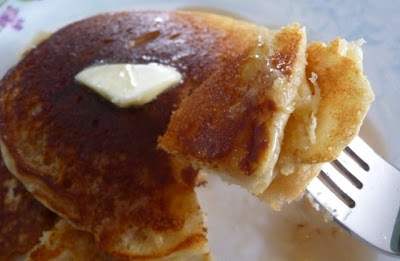 Pour pancakes with a 1/4 cup measuring cup - and cook on a pre-heated griddle.